The ongoing complaint from various U.S. cargo carriers took another turn some days ago when the American Teamsters Union sent a two page written plea to U.S. President Donald Trump on behalf of five of its member airlines in the USA. The letter, which was written on April 5, was followed up by pilots of the airlines concerned public picketing in front of the White House in Washington. In the letter, the main emphasis was on “foreign influence” - a statement which surely would be music to Mr Trump’s ears at the present time. 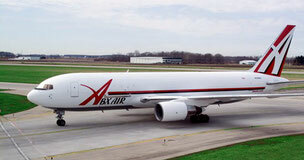 The Teamsters Union was writing on behalf of pilots from Atlas Air, Southern Air, Polar Air, ABX Air and Kalitta Air, all of which are U.S. registered freighter carriers. They claim that they collectively are operating 70 percent of DHL’s global flights and that DHL has in the meantime far too much influence on how these carriers operate and the conditions under which the pilots are expected to work. Quote: “This foreign influence is driving down wages and benefits and undermining standards set by American shipping companies such as UPS and Fedex. DHL’s blatant disregard for the standards that have long defined America’s piloting tradition has serious consequences. At one of our airlines, the pressure to meet the company’s growing demands is so high that many of us are regularly forced to fly much longer hours than pilots at other U.S. carriers - putting us at risk of a level of fatigue that even the FAA warns is dangerous.” Unquote. On the other side - some might be of the opinion that if the above were true, then it’s the U.S. carriers themselves that make the situation possible. DHL, as main customer for the airlines mentioned is of course pushing for the best service possible in order to keep their customers satisfied. However, it is hard to see how they can officially influence operating procedures at all of there airlines. Is it that U.S. airlines themselves are bending the law, but never really breaking it? The U.S. airline management are said to be using the open skies agreements, cabotage and so on, to give foreign companies an easier way to access the U.S. markets in a way that only U.S. companies could previously do. But, look at Fedex and UPS operations in Europe! They are operating based on the same principle as shown above by using the services of various European carriers, and nobody is complaining whatever. Many of these same carriers are more or less dependent on UPS and Fedex in order to stay alive. The above-mentioned carriers also depend on the DHL business in order to stay alive. Is this then another example of attempted U.S. protectionism? “DHL is one of a number of customers of the airlines concerned and we therefore don’t believe it would be appropriate for us to comment on the letter, particularly against the background of ongoing discussions between the airlines and their employee representatives. It would seem ridiculous if Mr Trump were to let himself be drawn into a conflict on this issue. But, who knows, “which way the cookie crumbles” - as the Americans say.